Vegan meal delivery services offer raw, alkaline, and gluten-free foods, bringing your next nutritious meal directly to your dinner table. Enjoy the healthiest foods in the world and save both animals and our planet with a little help from high-quality meal delivery services. These 10 companies are the best vegan meal deliveries currently on the market. If you’re looking for meals made from 100% organic greens, hand-picked for every meal and delivered to your door, Veestro is the right choice for you. Delicious, healthy, organic, green! 22 Days Nutrition is here to give all vegans an opportunity to have fresh, organic meals delivered to their doorsteps. You can opt for one of three weekly meal plans or order a la carte. Atkins Meal Delivery is a vegan-friendly weight loss meal delivery that offers 80+ low-carb meals and extras, many of which are plant-based. Pick your favorites and order commitment-free. Use code: ATKINSAFP10 and get 10% off sitewide! 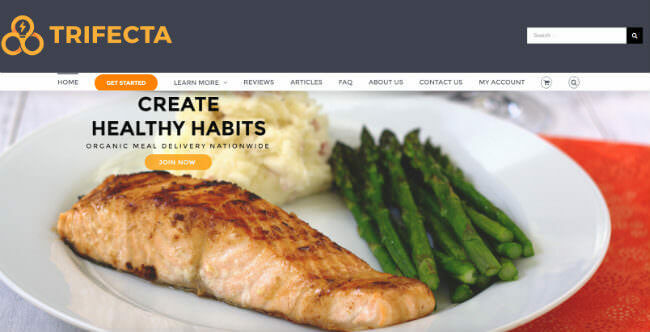 The Trifecta Nutrition meal delivery service will support your decision to lead a healthy and humane lifestyle. Enjoy the wide variety of tasty vegan dishes made with the finest organic ingredients. Healthy Chef Creations offers plant-based, nutrient-dense dishes for your healthy vegan eating plan. Order anything you want a la carte or customize one of the meal plans to meet your needs. Vegin’ Out is a meal delivery service that focuses solely on providing the best of what vegan cuisine has to offer. It boasts new menu items weekly, top-quality produce, and great customization options. 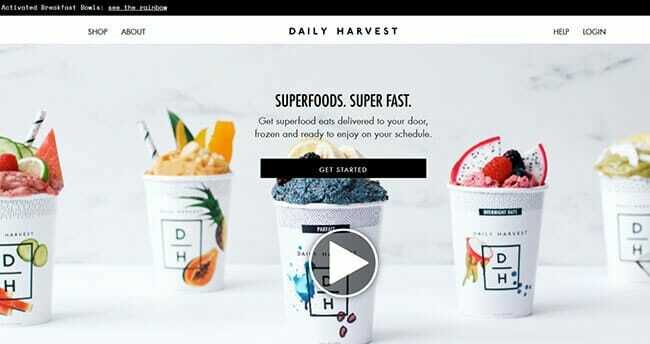 Daily Harvest is a vegan-friendly meal delivery company that offers healthy, just-add-liquid meals in a cup, ranging from hearty soups and dinners to overnight oats, smoothies, and parfaits. Kitchen Verde is a vegan meal delivery offering ready-made breakfasts, lunches, dinners, snacks, and add-ons that can boost your immunity, keep you healthy, and take inches off your waistline. FreshDirect is a vegan-friendly organic meal kit delivery that provides superior-quality ingredients and delicious vegan recipes that are both quick and beginner-friendly. Use code: THIRTY3 to get an 30% off your first 3 purchases! The Vegan Garden offers tasty, 100% vegan dishes for every meal of the day. It offers 6 vegan meal plans, various meal packages, and numerous delicious smoothies, cleanses, and teas. Meal delivery is an excellent option for vegans who do not have the time to do all the grocery shopping and meal preparation every single day. Vegan fast food is still a budding concept and in some areas, it borders with fiction. So, instead of going for some greasy French fries or a bland, boring sandwich, many vegans sign up for meal delivery services because these really do make life easier. Good vegan meal delivery services allow you to enjoy the same quality of food you get at some of the finest vegan restaurants, minus the high prices and with the added convenience of home delivery. They let you plan out your meals more easily than ever and choose from a range of tasty and creative plant-based dishes. Thus, they help you save time and bring more flavor into your life and greater diversity into your diet. With the right vegan meal delivery service, you are always minutes away from a perfectly satisfying meal. Whether the service of your choice delivers fresh or frozen-fresh meals, you can easily stock up on your favorites and have the ideal match for your cravings right in your fridge or freezer. Last but not least, the best vegan meal delivery services constitute one of the easiest solutions for a healthy, balanced diet. They use premium-quality, often organic ingredients, make sure their meals are nutritious, and deliver healthy dishes for all meals of the day, so you never have to settle for an unfulfilling meal just because you are short on time. If you are considering subscribing to a vegan meal delivery, then any of our top-ranked companies is a safe choice. First of all, they are reliable and trustworthy when it comes to the quality of their food. There are no variations in portion size and ingredient quality, no sad-looking meals that turn into a mush by the time they reach your home, and no complications when changing or canceling your order. The entire experience is geared toward your pleasure. Second, they all offer a wide variety of vegan options, whether we are talking about just a few dinners every now and then or several different meals, complete with snacks and, in some cases, desserts and even shakes and smoothies. Third, they all allow you to customize your menu, which is important because some people have other preferences in addition to vegan food as well – they may be allergic to certain ingredients or they may only eat organic and locally sourced food. Finally, the best vegan meal delivery services featured on our list go to great lengths to ensure that their meals are not only tasty and varied but also incredibly healthy and optimally balanced. They employ various experts – dietitians and nutritionists, sometimes even physicians – who make sure their meals meet all the nutritional standards for vegans. That way, you can relax, enjoy your food, explore new flavors, aromas, and textures, learn a thing or two, and be sure you and your family are getting exactly what you need. More and more people around the nation are finally recognizing the benefits of the vegan diet, so it is no wonder that numerous meal delivery services now offer cruelty-free meals in order to satisfy the growing demand. However, not all meal delivery services that offer plant-based meals and meal kits truly understand what the vegan diet is all about and the range of vegan meals they offer is often not enough to satisfy the needs and appetites of epicurean herbivores. Fortunately, we are here to help you successfully navigate the vegan meal delivery market and enjoy the home dining experience you deserve. We have singled out the best vegan meal delivery services that offer the widest variety of healthy, tasty, chef-prepared meals and convenient kits that allow you to have a delicious plant-based meal on the table in minutes. All of them offer meals designed by professional chefs who have a deep understanding of cruelty-free cuisine, which is reflected in the superior flavor and ingenuity of every dish. Our goal was to identify the services that do not only have varied vegan-friendly menus but also perfectly satisfy your nutritional needs. The companies on our list use only the finest, most nutritious ingredients and offer well-balanced meals. Furthermore, they make sure that the portion size is always adequate, so every meal is perfectly satisfying. What is extremely important is that these services never make you conform to their subscription plans but instead offer flexible subscriptions that can be customized to suit your lifestyle. Some of them even let you shop as often or as rarely as you please. Finally, all of our top picks offer premium-quality meals at reasonable prices. They do not only allow you to enjoy the finest vegan dishes whenever you crave them but also offer the best value for your money. The following price comparison is designed to help you easily figure out which of our top-ranked vegan meal delivery services best fits your budget. We have brought all the pricing information to one place, including the shipping costs and details about the companies’ delivery areas, so you can identify the perfect fit in a single glance. What all of our top picks have in common is that they are currently the best on the market. Now it is time to discover what makes each of these vegan meal delivery companies unique. Explore their distinctive features in the mini-reviews below and choose the one that best satisfies your needs. Optimized for the best possible flavor, all meals prepared by Veestro chefs are made from 100% organic, preservative-free, and non-GMO produce. As one of the best meal delivery services for vegans and vegetarians alike, Veestro selects the freshest produce from farmers’ markets and prepares meals that are balanced for perfect flavor and nutritional value. While 22 Days Nutrition may be best known for its creators – Beyoncé and her trainer Marco Borges – it is its dedication to quality that truly sets it apart. All of its meals are USDA-certified organic, gluten-free, soy-free, dairy-free, GMO-free, and plant-based. They are healthy, delicious, and ready to eat. Choose from a variety of delicious vegan breakfast, lunches, dinners, protein bars, and protein powders. 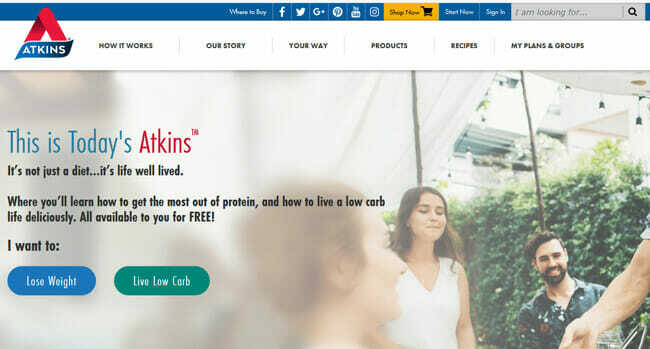 Atkins Meal Delivery is a vegan-friendly delivery service that makes weight loss easier for everyone who wants to try out the Atkins weight loss program, including individuals on plant-based diets. The company’s online store features vegan meals and snacks that are low in carbs and designed to help your body switch from burning carbs to burning fat. If you want to experience the joint benefits of veganism with a low-carb diet, be sure to give Atkins Meal Delivery a try. No subscription is required and the meals are quite affordable. Trifecta Nutrition offers a great selection of plant-based meals and aims to satisfy the gastronomic needs and desires of all of its vegan customers. Its dishes contain nothing but the finest and freshest organic ingredients. Whether you wish to have your meals ready-made or just want to skip the cooking part and go straight to combining cooked food into a perfect meal seasoned to your taste, Trifecta has got you covered. Healthy Chef Creations has all the plant-based goodness you need to keep your body fueled and your appetite satisfied. Depending on your needs and lifestyle, you can order a la carte whenever you wish or have the service create a completely customized vegan meal program just for you. Enjoy maximum variety with its rich seasonal menu of 1,000+ meals rotating weekly. Menu items include breakfasts, lunches, dinners, desserts, and add-ons such as salads and soups. Vegin’ Out is a dream come true for vegans throughout the nation. Unlike with most meal delivery services currently out there, there is no need to browse through the menus just to find out that only a handful of vegan dishes are offered. At Vegin’ Out, every dish on the menu is completely vegan, with no eggs, dairy, meat, honey or calcium caseinate. Enjoy healthy entrées, sides, soups, and cookies. With Daily Harvest, you can have your meals ready in minutes and feel more energized than ever thanks to the abundance of superfoods in every one of its cups. You get to choose how many cups you want per week and select any of over 2 dozen menu items. The meal selection is constantly enriched with healthy soups, meals in a cup or bowl, chia parfaits, and even lattes and sundaes, all 100% natural and vegan-friendly. 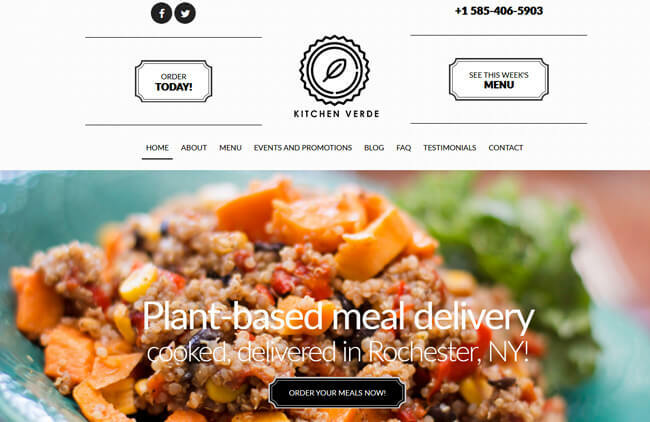 Kitchen Verde is a vegan meal delivery service that provides healthy, chef-prepared, plant-based meals to the residents of Monroe County, NY. All of its meals are natural and free from animal products, the majority of items are free from gluten, and there are always a couple of nut-free items on the menu as well. It offers dishes for all 3 meals of the day, along with healthy snacks, drinks, comforting soups, and tasty sides. FreshDirect is a one-stop solution for all your dietary needs. Its assortment of vegan-friendly products is impressive and features everything from the freshest fruit and veggies to ingenious plant-based dishes from famous brands such as Beyond Meat. Ordering is as simple as it gets and you can fill your pantry and fridge with as many healthy, vegilicious items as you need. Freshness and quality are guaranteed due to its commitment to the best, farm-to-table sourcing practices. The Vegan Garden offers gorgeous meals made with top-quality plant-based ingredients. It allows you to take a trip around the world and enjoy the best of what cruelty-free cuisine has to offer. Whether you are trying to lose weight or just eat healthily, this company has just the right vegan meals to help you reach your goals. Order a la carte or choose from a variety of vegan meal packages and plans.